"World's first" 7-in Honeycomb tablet? ViewSonic ViewPad 7X - a bite-sized Honeycomb treat? After leaking out earlier this month, the ViewSonic ViewPad 7x has got all official over at Computex, promising to be the world's first 7-inch Honeycomb tablet. So if you've been jonesin' for that Honeycomb goodness on a smaller-than-10-inch screen, there's no need to wait around for Acer to solve its Iconia Tab A100 problems or HTC to finally port the OS to the Flyer. 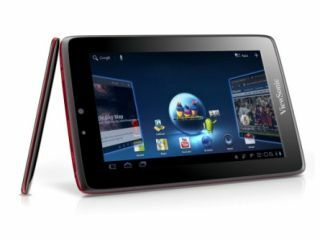 It's not clear whether it will come with Android 3.0 or 3.1 yet, but the ViewPad 7x will be rocking a dual-core Nvidia processor, front- and rear-mounted cameras, capacitive LED touchscreen display and HDMI port. The touchscreen has capacitiy for every single finger you've got, with 10-point multi-touch (although whether or not you could fit all your fingers on the 7-inch screen at the same time is another matter). As well as the ViewPad 7x, ViewSonic is showing off the ViewPad 10Pro, a 10-inch tablet with Intel Oak Trail chipset that can dual-boot Windows 7 Professional and Android at Computex. There's also a 24-inch LED 3D monitor, known as the V3D245wm-LED, a WXGA pico projector, an ultra-slim digital picture frame and the ViewSonic HD camcorder series on show. The ViewPad 7X is set to hit the shops in North America this summer, with a UK release date no doubt not far behind.